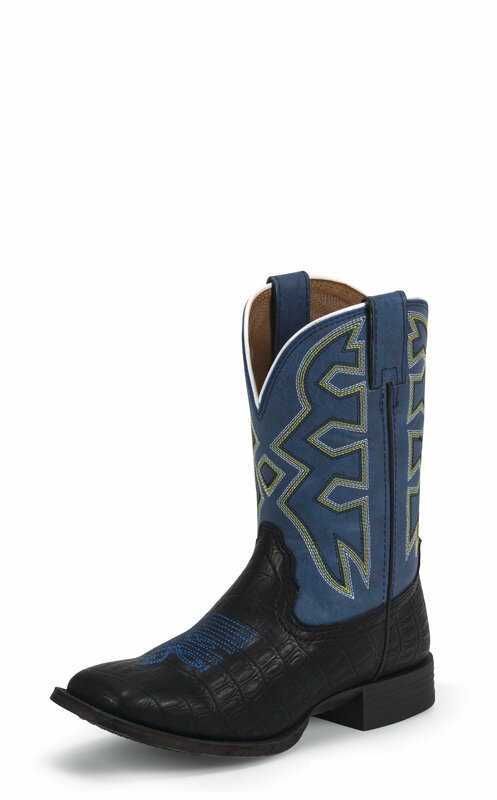 The Pistol is a kids' Let's Rodeo® cowboy boot with a grownup look. The bright blue upper features a geometric yellow, white, black stitch pattern giving this boot a modern feel and it's paired with a polished black alligator print foot for an exotic touch. The square toe has a royal blue stitch pattern on the foot and the white trim around the collar is yet another detail that sets this special boot apart. The unit heel and cushioned insole provide a relaxed and comfortable fit in or out of the saddle.